Reports from past trainings and events, and some thoughts and tips for future development. When Cryonics UK announced that they would do a road show and training session in 2015 in mainland Europe, we got very excited. Cryonics UK organizes sessions in UK four times a year, and members of our group, Cryonics Germany, had been going there every once in a while for the last few years. 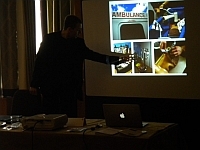 But logistics are much easier when there is no air travel involved, so we looked forward to not only getting hands-on training from the experienced folks from Cryonics UK, but also brought along the full set of our equipment. This way, we could show what we had, and get instructions and feedback on our kit. 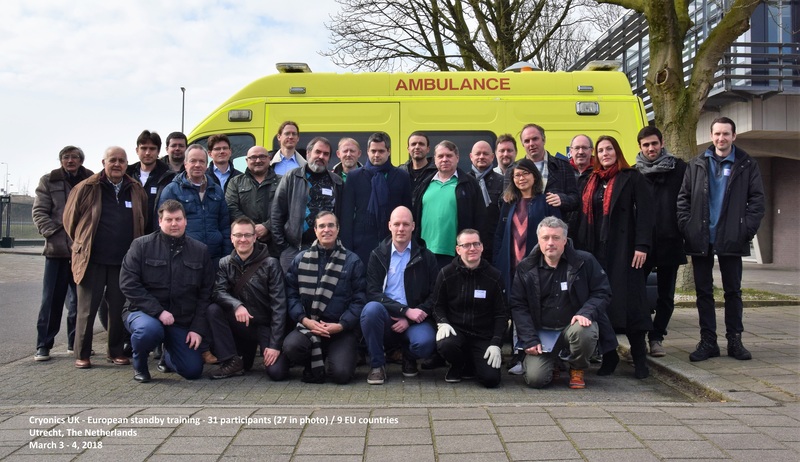 The training took place on the weekend of November 14 and 15 in the city of Utrecht in the Netherlands, and was graciously hosted by the Dutch Cryonics Organization (DCO). The Dutch guys did a fantastic job at organizing the meeting. We had a nice location, a spacious room where we could set up and train, and a great dinner on Saturday evening. All in all, 19 cryonicists from four different countries joined. There were 5 members from Cryonics UK (with Tim Gibson as always doing a fabulous job with leading the meeting and the training sessions), 7 members from DCO (with Jappie Hoekstra as main organizer), and 5 members from Cryonics Germany. 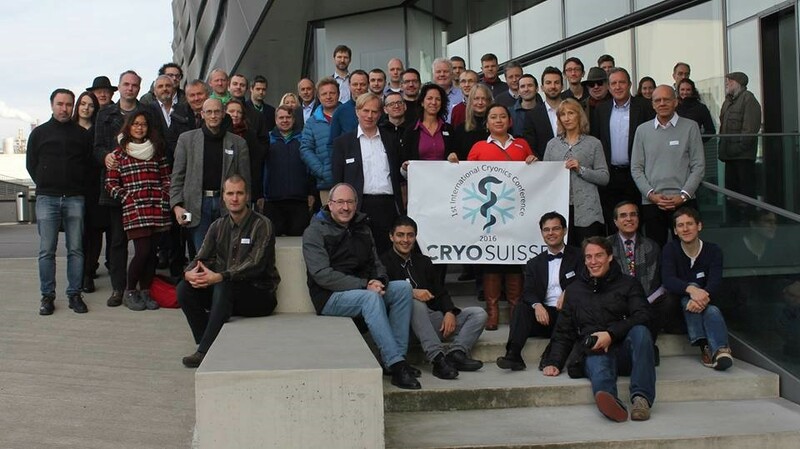 We were especially pleased that 2 members of CryoSuisse, the newly founded Swiss cryonics organization, were present as well, including their president Patrick Burgermeister. The training sessions covered two full days, and included setting up the ice bath, the infusion of medications, operating the thumper and setting up the perfusion, as well as a summary / walkthrough of a whole case, from preparation to shipping. Cryonics UK had brought along their fully equipped ambulance, which is always great to see (have a look at their website at cryonics-uk.org), and their training dummies and materials. It was the first time the ambulance had been across the channel, and so this was also a good testing case for a deployment to mainland Europe. If a case arises in Germany, we will operate in joint fashion: Cryonics UK will handle the case and come over in their ambulance, and our volunteers will act as local liaisons to the hospital and doctors, as well as helping with procedures and equipment. While we are equipped to handle a case by ourselves on a minimal basis, the UK team has much more equipment and experience. For this reason, their cooperation is vital to us, and we are very grateful for their continued support (for example, our equipment is to a major part based on their inventory lists). Apart from the training sessions, we also had detailed discussions of the last two cryonics cases in the UK (one in 2014 and one in 2015, which members from Germany had joined in for both cases), practical experiences and lessons learned. An important part of any case is securing the cooperation of hospital staff and doctors. Cryonics UK does a great job here, which has allowed them to initiate cooling quickly, often within minutes of cessation of heartbeat. The training sessions were intense, and some of our newer members felt their heads spinning from all the information. But from my experience, with the second and third training the equipment and steps become more familiar and things falls into place. And luckily, there was time to relax as well. When we weren't in session, we had lots of fun getting to know each other, and discussing cryonics, life and everything else. As a nice bonus, we were also pleased to take into our possession two LUCAS-1 thumpers. Their story serves as a neat example for our well-functioning cooperation in Europe: We had gotten a hint from our friends at KryoFIN (the Finnish cryonics group) that some used, inexpensive LUCAS devices were on sale on Ebay. We procured two for a really good price (less than $300 each), but the supplier could only ship to the UK. So Cryonics UK was kind enough to have them delivered to their place, and bring them to Utrecht for us. They are now at our main hub in Dresden. Altogether, the weekend in Utrecht was fun and productive, and I really liked the spirit of openness, enthusiasm and shared aspirations. It was great to see that cryonics is growing healthily in Europe. Where a decade ago there was (almost) only Cryonics UK, we now have strong organizations in many European countries. There was actually quite a bit of talk of forming a European Cryonics Organization to coordinate our efforts. I certainly feel the time for this is coming, and I am pleased and proud to see cryonics developing so well here on this side of the Atlantic. Thanks again to Cryonics UK and the DCO for making this wonderful meeting happen. This was the first, but certainly not the last pan-European training weekend. Stay tuned! If you have decided that cryonics is for you then there are a number of things you should definitely do sooner rather than later. These are things that may be difficult to organise from a hospital bed and impossible from the local mortuary. 1. MAKE A DECISION and then act on it. Choosing the right cryonics service provider is not as important as simply having one ready for when you need it. By all means, take a little time to do some research but beware of prevarication – a recent patient had six weeks from diagnosis to cryo-preservation. You can always change your mind later. 2. MAKE STAND-BY ARRANGEMENTS. Finalising a contract with Alcor, Cryonics Institute or KrioRus is only one half of your cryonics arrangements. The other half should include a plan for cool down and transportation to the US or Russia- and this where Cryonics UK come in. Stand-by arrangements can be paid for by overfunding with your cryonics provider so that they can pay your standby expenses. Without standby, a funeral director will pick you up some hours after your death, cool you down to dry ice temperature and ship you to your cryonics organisation. But if you want to avoid the worst damage to your brain it is better to have a cryonics standby team ready at your bedside to start cool down and cardio-pulmonary support immediately. Cryonics UK volunteers are also trained to administer meds and perfuse the brain to prevent ice crystal damage as quickly as possible after legal death. 3. WRITE A LETTER TO YOUR DOCTOR, stating your intention to be cryo-preserved and asking whether he or she will cooperate. You may also like to include a checklist of cryonics procedures for hospitals. Follow this with a visit and speak to your doctor about it. He or she should be impartial so if you are unhappy with the response you receive change to another doctor. 4. TELL YOUR RELATIVES. They may get a shock but it will be more of a shock if they find out immediately after your death. In such difficult circumstances they may block your preservation. Telling them beforehand gives them the chance to get used to the idea and gives you the chance to explain how important it is to you. You can reassure them that you have considered all the arguments and you still want to do it. Having a cooperative next of kin is vital for a successful standby. He or she must be prepared to brief medical staff BEFORE death and to call CUK whenever there is a change in your health status. They must be available to permit release of your body to CUK and they must arrange for a death certificate. It may also help them to have Lasting Power of Attorney over your health and welfare. If you think your current next of kin will be unable to cope with these demands or is unsupportive of cryonics then you should consider appointing someone else. A solicitor can arrange this and can act as your next of kin if necessary. 5. WRITE A LIVING WILL. In your living will you might like to write down your wishes for what you would like to happen should you become unconscious or incapable of making your own decisions. A doctor will usually place importance on a living will. 6. WRITE A WILL. Dying intestate (without a will) slows down procedures, which could delay the life assurance pay-out to the cryonics provider, and exposes the estate to claims from family members. Specifying cryonics in your will puts your arrangements in a strong legal position. You should also rewrite your will after every significant life event, such as marriage or childbirth, to reaffirm your wishes. It is worth noting that the law protects minors: life insurance funds and other assets can be allocated to care for minors, against the wishes of the deceased, where adequate provision has not been made for their care. Keep copies with your solicitor and the executor of your will. 7. KEEP YOUR VITAL DOCUMENTS IN ONE PLACE. Insurance documents and accompanying trust documents. Cryonics UK membership information and contact details in case of emergency. NHS registration number – vital for getting a death certificate. Passport – helps avoid delays at customs, for transport overseas. 8. TAKE STEPS TO AVOID AUTOPSY. An autopsy or post mortem examination is usually required if a person dies unexpectedly. A doctor must ask your next of kin for permission to perform a clinical autopsy but if the coroner orders a medico-legal autopsy this cannot be refused. It may be possible to negotiate with the coroner regarding how it is performed but this will cause lengthy delays. If you have been seen by a doctor in the fourteen days before your death and your death is expected then an autopsy is not usually required. Do not delay seeking medical assistance. Religious objection to autopsy forms have no legal weight in the UK but serve to inform doctors and relatives of your wishes. 9. DISTRIBUTE EMERGENCY CONTACT DETAILS. Make sure family and friends know who to phone in an emergency. Purchase a contact bracelet from your cryonics provider and make sure you include the contact details of your local standby team. Numbers from the Cryonics UK website can be used for this purpose. 10. KEEP IN TOUCH! Don't forget to update your contact details with Cryonics-UK and your cryonics provider. Tell us of any serious changes to your health. Having some warning of a member who may require our services helps us to plan for the individual circumstances of the case. If we are not contacted until after death we may not reach you in time to perform perfusion with a cryo-protectant. People who plan for their stand-by tend to be the people who achieve the best preservation. Pay us a visit as well as your membership fee. You may have decided that training to attend an emergency is not for you but there may be other ways you can contribute a little of your time. Cryonics UK is a SELF help group and the more our members put in the more we all gain. Please contact us for further information on any of the issues raised in this document. We took our training weekend on the road this time to give members who may have difficulty travelling to Sheffield and other interested people down south a chance to see what we do. It also gave regulars the opportunity to familiarise themselves with Rowland Brothers funeral directors. In an emergency they will have to quickly locate the premises and use facilities there. A few members travelled down early to meet with Tony Rowland to discuss how we will work together in the future to help our members most efficiently. On Saturday we had a great turnout with more than 20 people. There were a few who had not been for a while and quite a few newcomers. Six cryonicists from the German cryonics group, Deutsche Gesellschaft für Angewandte Biostase e.V. came to see how we do things and to also discuss working together across Europe. We began Saturday morning with a workshop on standby procedures until we could build up a flow chart of everything we do and in the right order. Seeing the overall picture is important as we usually spend most of the time focusing in on the details. Next we took a tour of the ambulance, encouraging everyone to rummage through the many hidden cupboards so we can locate the items we need quickly in an emergency. We moved on to the mortuary where the ice bath and Bob (our training dummy) awaited. We practiced inserting the intraosseous infuser into the chest and setting up the IV lines (IO lines to be precise) for administering meds. Next we practiced intubation which is often easier on a real person than a training dummy. The combitube airway tends to stick on the rubber of the dummy making it difficult to slide it down without lubricant. We reflected that anyone who can master it on the dummy probably has a good chance of succeeding with a real person when the time comes. Rowland's staff gave us a tour of the premises which are a lot bigger than they look from the outside. They showed us the room that will soon be a new state of the art mortuary to be completed by the end of the year. In the evening we all managed to squeeze into three cars and the ambulance and met up at the Gipsy Moth for a pub meal and plenty of discussion. On Sunday morning we were joined by Chris Morgan, an insurance agent who has in the last year begun to specialise in arranging insurance for the purposes of cryonics. Chris did a presentation on the work he has been doing and the service he provides. He now has a new website specially for cryonics customers. He also discussed an upcoming meeting with a solicitor who will be able to act as a trustee/legal power of attorney for cryonicists who either have no next of kin or whose next of kin are not supportive of cryonics. It was agreed a member of CUK would also attend to help brief the solicitor on what we require, for example, on how time sensitive an emergency situation is likely to be. After lunch we concluded the weekend with demonstrations of and practice in setting up and running the thumper (heart lung resuscitator) and later the perfusion kit. A big thank you to Rowland Brothers for hosting this event and to their very helpful staff. Photographer Murray Ballard had visited Cryonics UK a few times. He also visited cryonics storage facilities at Alcor and Cryonics Institute in the US, and Kriorus in Russia. 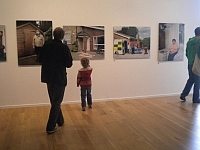 On Friday afternoon David and I visited Impressions Gallery in Bradford, to see Murray's public exhibition. Many people scanned the QR-codes placed below the photographs. Some of the URLs led to voice recordings of the portrayed persons, adding another dimension to the visual experience. Cryonics UK was pictured showing both our old premises in the South of England (not here in my photo) and the new one in Sheffield. You can see the CUK's ambulance, after it was repainted; and the blue horizontal thing is the Portable Ice Bath. 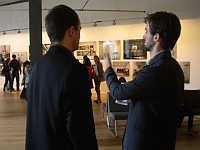 The meeting took place on Thursday, September 23, 2010 (12:00pm – 6:00pm), starting at a function room at the Sheffield Park Hotel, and progressing to our facility where the guests were shown the premises and ambulance. The Cryonics UK exposition / European workshop was an opportunity to get to know some very noteworthy guests from America who wish to meet as many cryonicists (especially Europeans) as possible at this event. Catherine Baldwin (General Manager, Suspended Animation, Inc.) and Saul Kent (CEO, Suspended Animation, Inc.; Director, Alcor; Co-Founder, Cryonics Society of New York; Co-Founder, Life Extension Foundation; Co-Founder and Director, 21st Century Medicine; Co-Founder and Director, BioMarker Pharmaceuticals; Co-Founder, Timeship Project) were in attendance. The day was pleasant and successful. 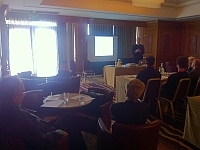 A presentation was given on the topic of CUK, and also a presentation on the topic of EUCRIO. 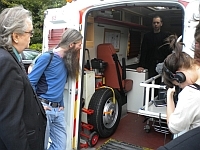 A video of CUK training was shown, tours were given of the CUK clinic, bulky equipment storage space, and ambulance. There was a CUK equipment show-and-tell. Many small peripheral meetings were made; some purely social, and some quite productive. We were joined by people from England, Scotland, Wales, France, Poland, Finland, and America.